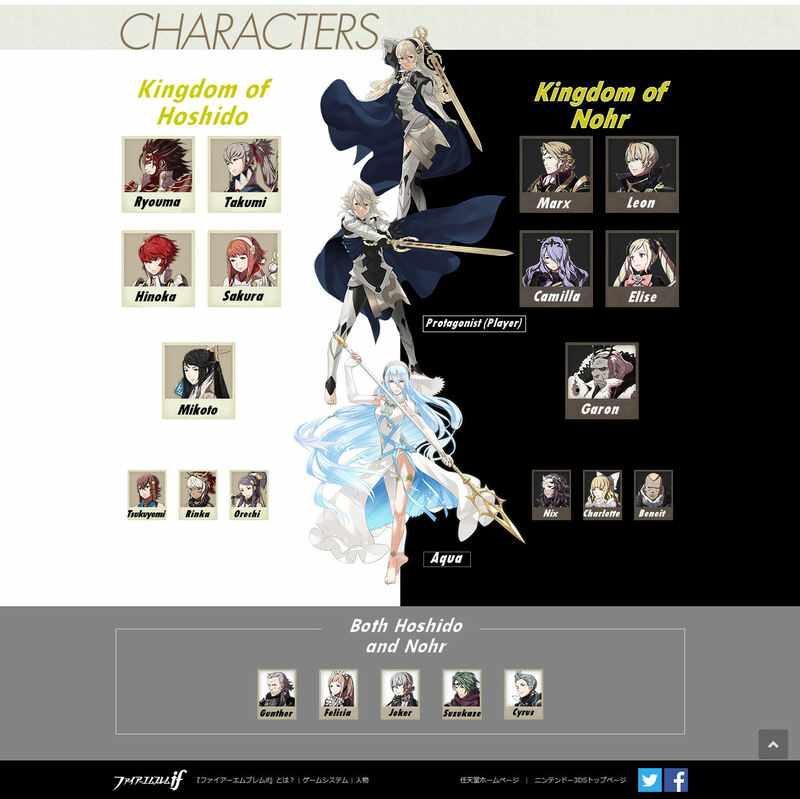 Born in the Kingdom of Hoshido, they were kidnapped when they were too young to remember. 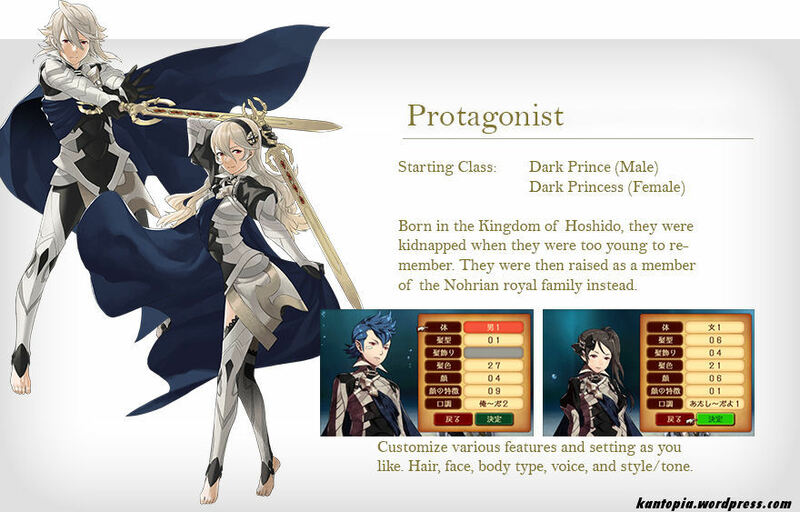 They were then raised as a member of the Nohrian royal family instead. Customize various features and setting as you like. Hair, face, body type, voice, and style/tone. 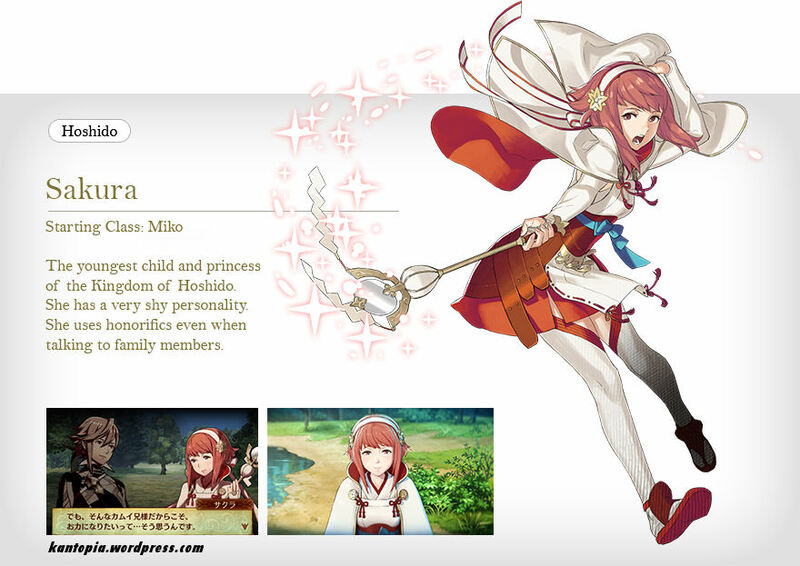 She is the opposite of the protagonist, having been born in Nohr but kidnapped and raised by the Hoshido. After she meets the Protagonist, she travels with them no matter what choice they make. She holds a special power in the songs she sings. 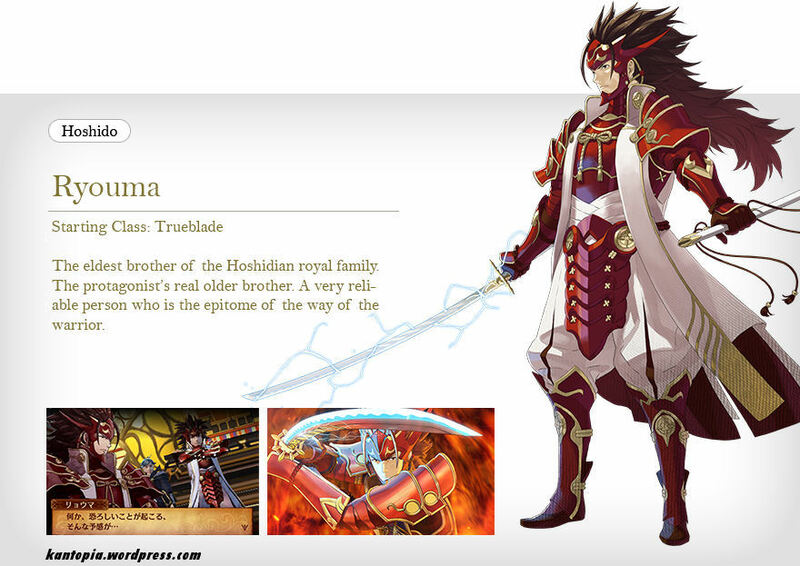 The eldest brother of the Hoshidian royal family. The protagonist’s real older brother. A very reliable person who is the epitome of the way of the warrior. 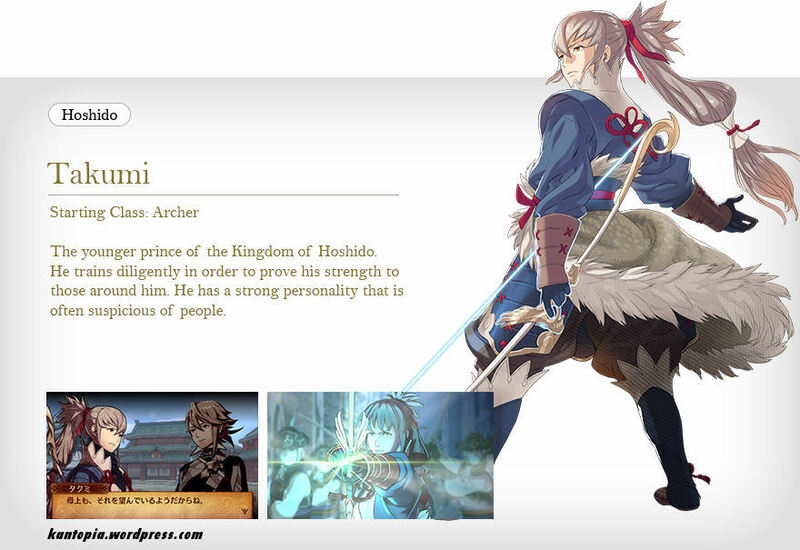 The younger prince of the Kingdom of Hoshido. He trains diligently in order to prove his strength to those around him. He has a strong personality that is often suspicious of people. Elder Princess of the Kingdom of Hoshido. She has a simple and honest personality that is fitting of a warrior. She took up learning the art of war after the protagonist was kidnapped. 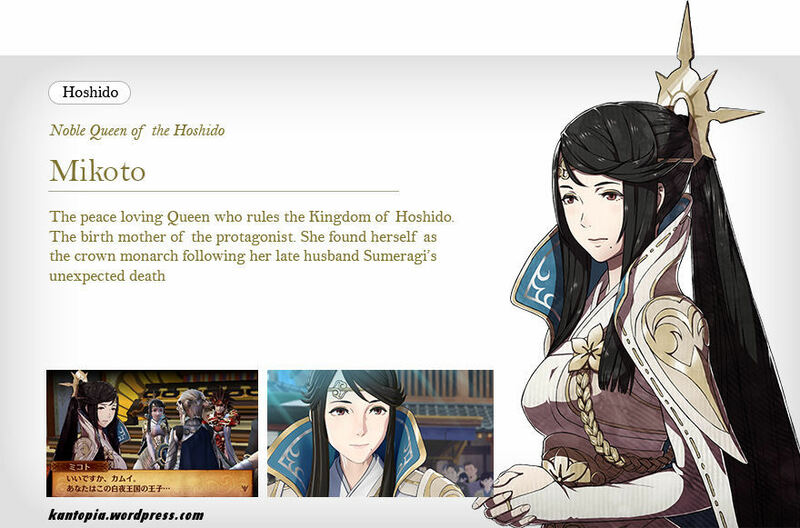 The youngest child and princess of the Kingdom of Hoshido. She has a very shy personality. She uses honorifics even when talking to family members. A spellcaster of the Tribe of Winds. A young boy with extraordinary ability. This influences his self confidence, to the point where it is rather high-handed. On the other hand, his weakness is being childish in some ways, such as being afraid of the dark. She is from the Tribe of Flames, which is an independent group from the Kingdom. 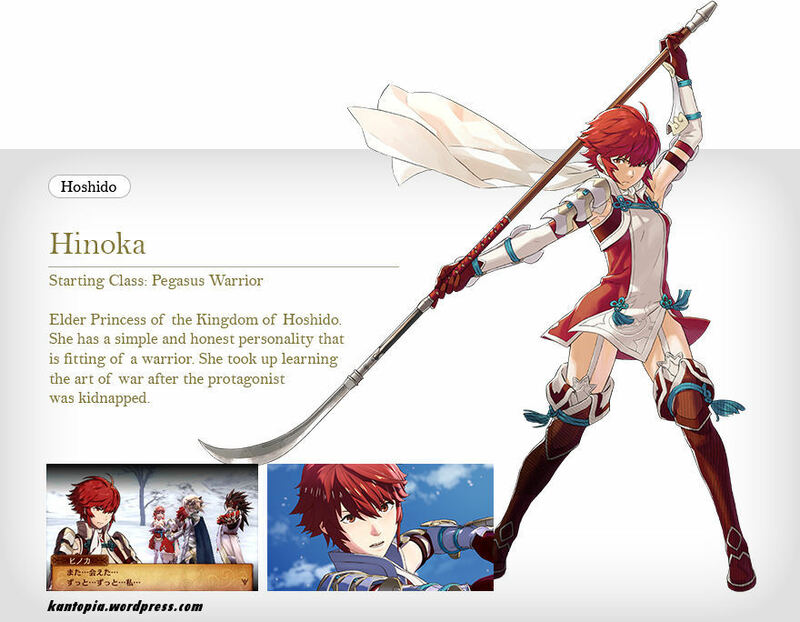 Following her father (the chief)’s orders, she moved to assist the Kingdom of Hoshido. In accordance with her tribe’s custom of honoring solitude, she does not interact with her comrades more than is necessary. She is a Spellcaster employed by the castle that expensive magic can be bought from. Though she has mysterious vibes with her calm, old fashioned manner of speaking, she actually has a bright and playful personality. 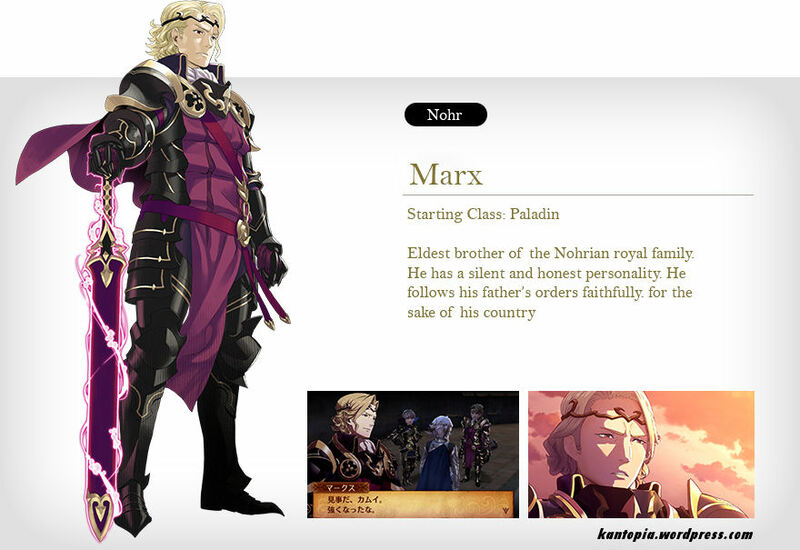 Eldest brother of the Nohrian royal family. 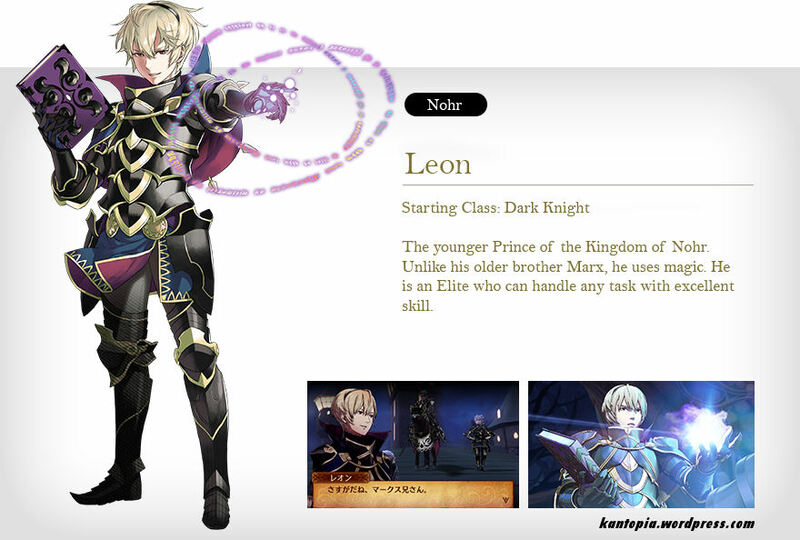 The younger Prince of the Kingdom of Nohr. Unlike his older brother Marx, he uses magic. He is an Elite who can handle any task with excellent skill. 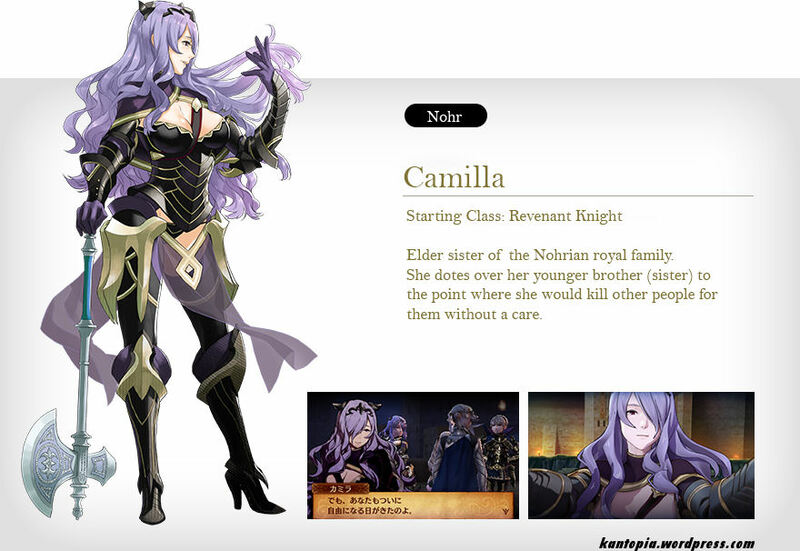 Elder sister of the Nohrian royal family. She dotes over her younger brother (sister) to the point where she would kill other people for them without a care. 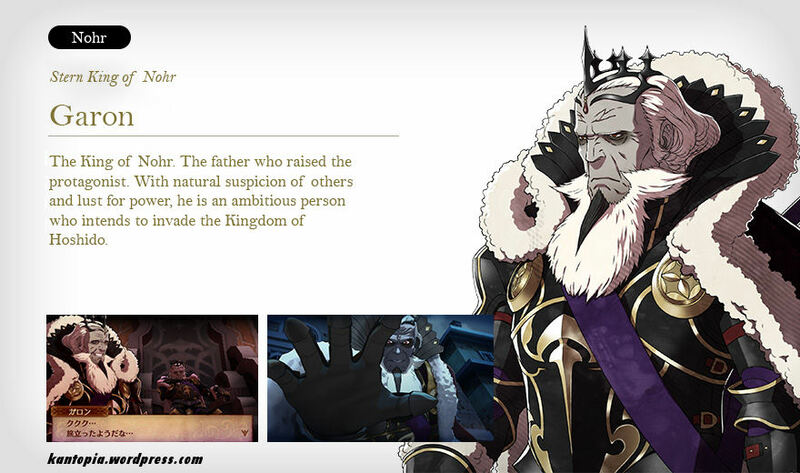 The youngest child of the Nohrian royal family with a naive personality. Though not related to the protagonist by blood, she talks to them as if they were her real family. The King of Nohr. The father who raised the protagonist. 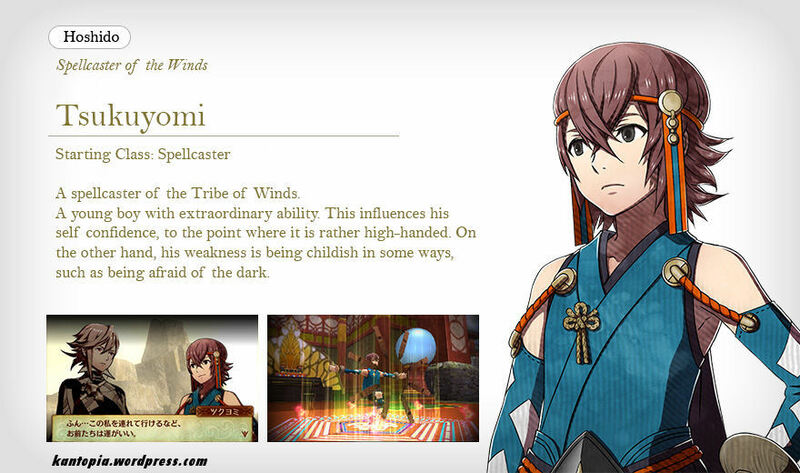 With natural suspicion of others and lust for power, he is an ambitious person who intends to invade the Kingdom of Hoshido. 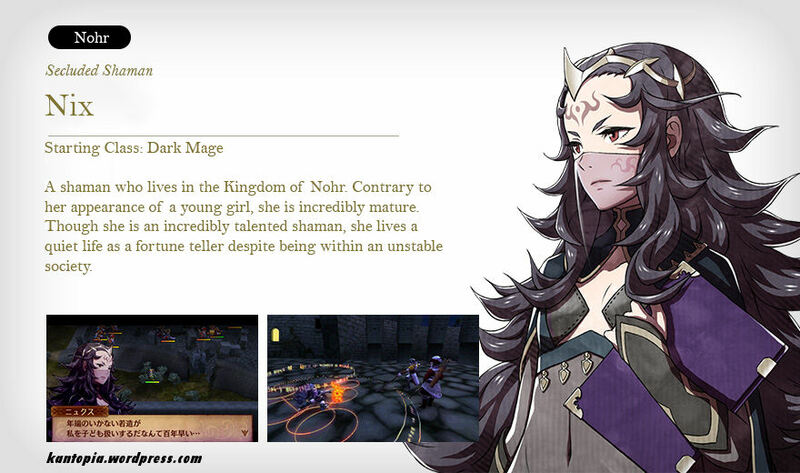 A shaman who lives in the Kingdom of Nohr. Contrary to her appearance of a young girl, she is incredibly mature. Though she is an incredibly talented shaman, she lives a quiet life as a fortune teller despite being within an unstable society. 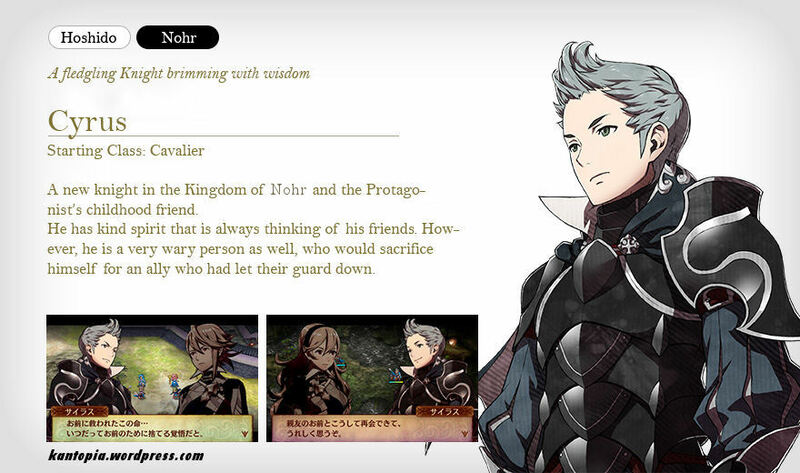 A mercenary of the border of the Kingdom of Nohr. She can be seen as a truly kind girl by anyone who talks to her, but this is just a play to get any man under her control. Her true nature is that of a strong yet crude hand to hand fighter. She dreams of marrying into high wealth and social status. 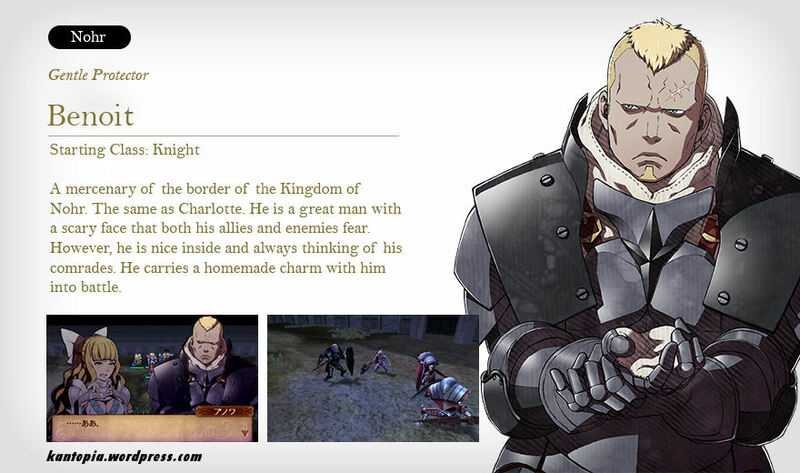 A mercenary of the border of the Kingdom of Nohr. The same as Charlotte. He is a great man with a scary face that both his allies and enemies fear. However, he is nice inside and always thinking of his comrades. He carries a homemade charm with him into battle. 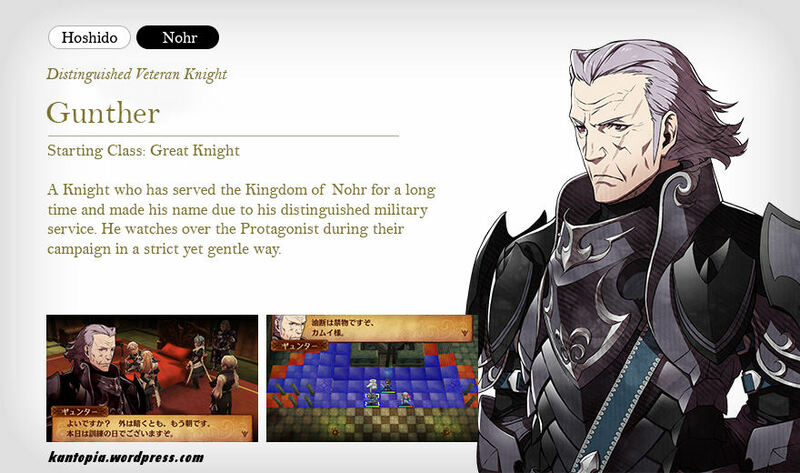 A Knight who has served the Kingdom of Nohr for a long time and made his name due to his distinguished military service. He watches over the Protagonist during their campaign in a strict yet gentle way. 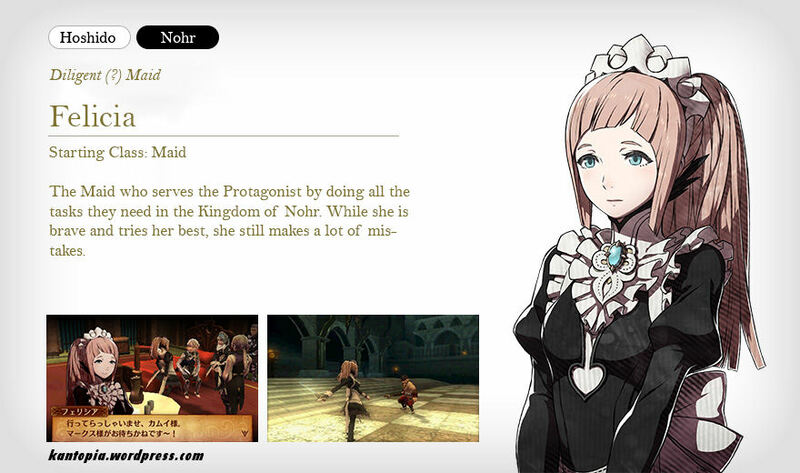 The Maid who serves the Protagonist by doing all the tasks they need in the Kingdom of Nohr. While she is brave and tries her best, she still makes a lot of mistakes. 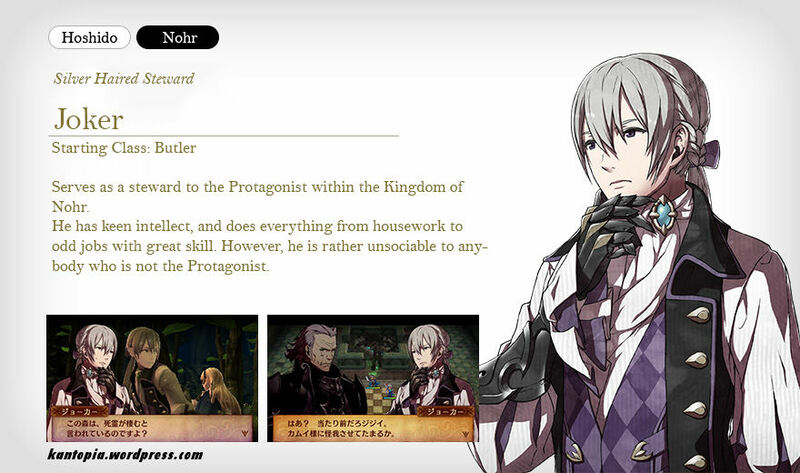 Serves as a steward to the Protagonist within the Kingdom of Nohr. He has keen intellect, and does everything from housework to odd jobs with great skill. However, he is rather unsociable to anybody who is not the Protagonist. 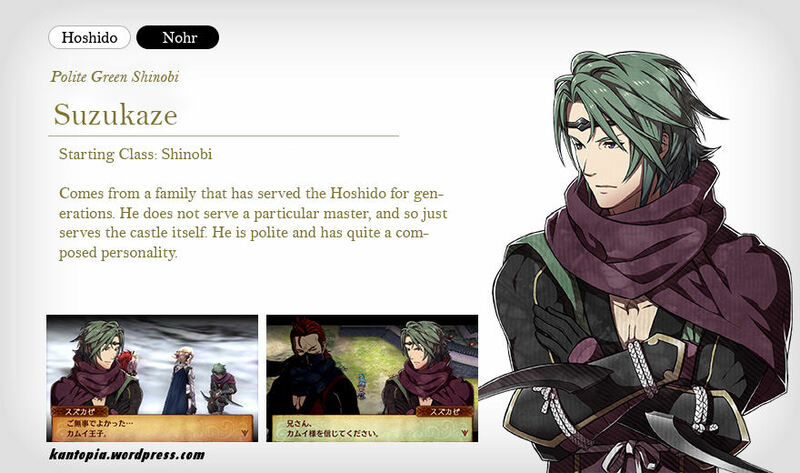 Comes from a family that has served the Hoshido for generations. 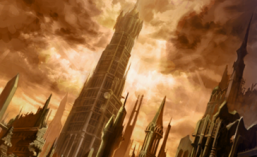 He does not serve a particular master, and so just serves the castle itself. He is polite and has quite a composed personality. 1: It is great you are safe… Prince Kamui. 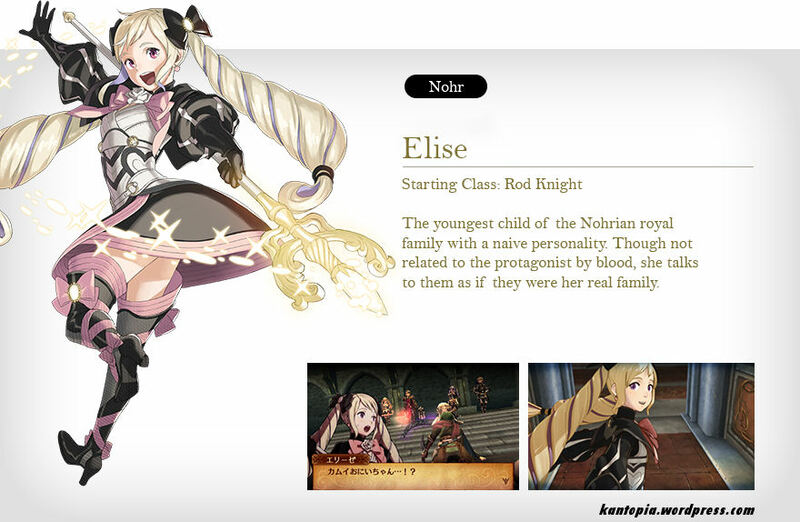 A new knight in the Kingdom of Nohr, and the Protagonist’s childhood friend. He has kind spirit that is always thinking of his friends. However, he is a very wary person as well, who would sacrifice himself for an ally who had let their guard down. 1: This life that you saved.. I am ready to throw it all away for you at any time. 2: I’m really happy I was able to meet you again, as your best friend. 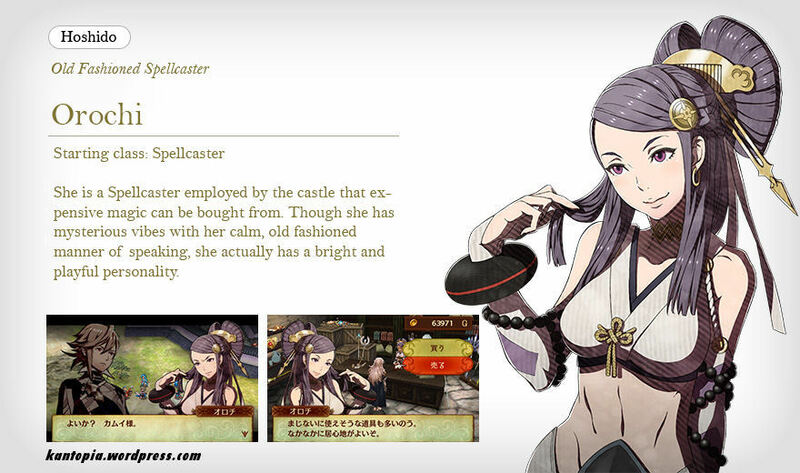 This entry was posted in Fire Emblem, Translation, Video Games, Website and tagged 5/31, axe fighter, benoit, camilla, character profile, charlotte, cyrus, dark mage, elise, english, felicia, fire emblem if, garon, gunther, hinoka, japanese, joker, knight, leon, marx, mikoto, new, nintendo direct, nix, orochi, phoenix wright, profile, rinka, ryouma, sakura, sakurai, suzukaze, takumi, translated, tsukuyomi. Bookmark the permalink. Thanks so much for the translation! These characters look very interesting. I’m liking Cyrus a lot. He looks like a fun and loyal friend. You’re welcome! 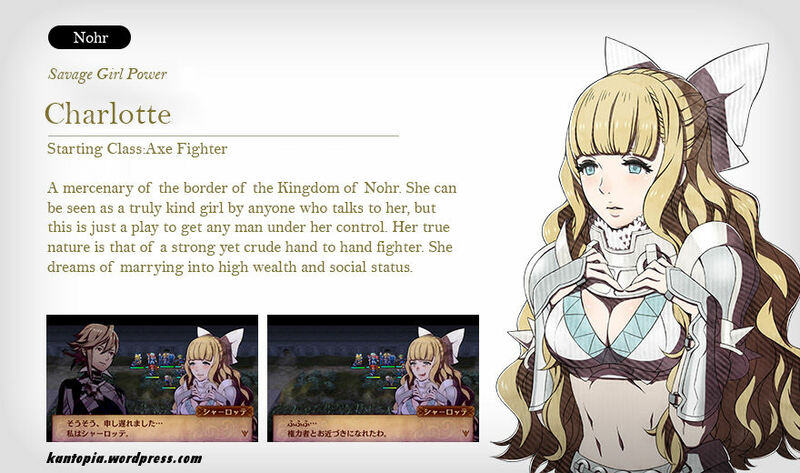 Indeed, I’m liking characters on the Nohr side better overall. Cyrus is on both though so that’s awesome! Gotta say, all these path-exclusive characters definitely ain’t making the choice any easier. Oh, it looks like he’s defending Suzukaze. I think. I’m sure you’ll at least hear about it long before then! Thanks for your translations, they’re very helpful. Yeah I wonder too… that will be one of the mysteries we look forward to being solved! Thanks! CHILDHOOD FRIEND! We have a childhood friend! That’s! So! Cute!! Cyrus huh…. I’ve already taken a shine to him. He’s kind of (really) handsome, too. Dang it. Thanks for translating! Right? A friend from childhood is always nice to have! You’re welcome! Did you know that you can now pre load the game? If you have a japanese 3ds. According to nintendo everything on twitter. Yep! I’m the one who tipped NintendoEverything on that : ) Already pre-downloaded and ready to go! 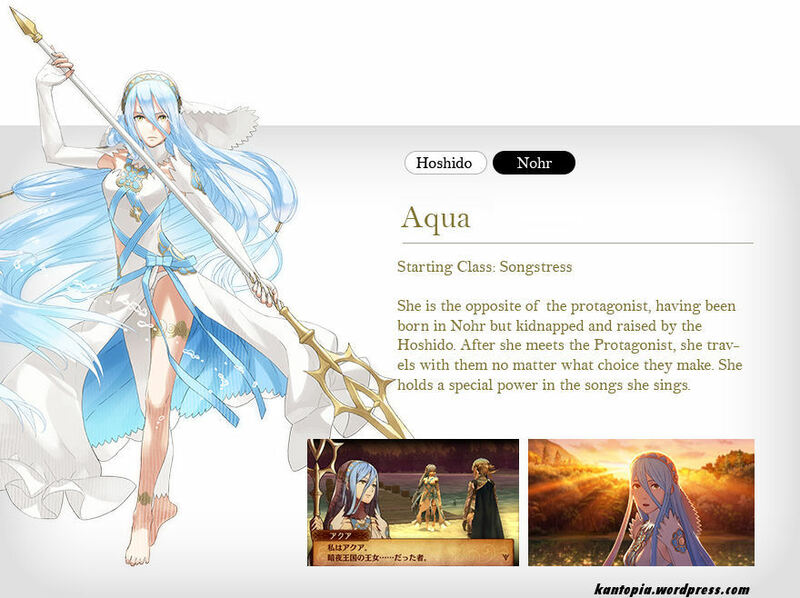 Finally, a name for the queen of Hoshido!